The BEST Corn Casserole - seriously delicious! 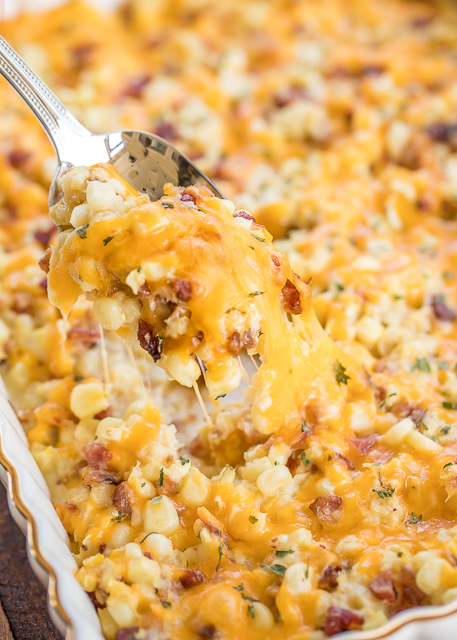 Creamed corn loaded with cheddar and bacon! SO good!! Can make ahead of time and refrigerate or freezer for later. Corn, eggs, flour, sugar, butter, cayenne pepper, cheddar cheese, bacon and Ritz crackers. Everyone RAVES about this easy casserole recipe. There are never any leftovers when I take this side dish to a party! Corn is one of my all-time favorite vegetables. I could eat it every day and never get tired of it. 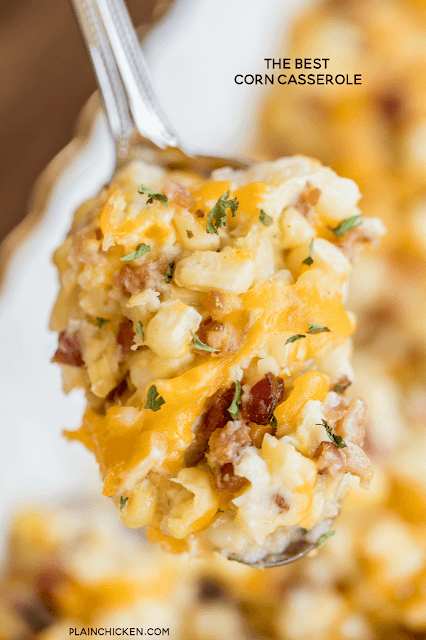 I'm always on the lookout for great corn recipes and I can finally say that this is The BEST Corn Casserole. 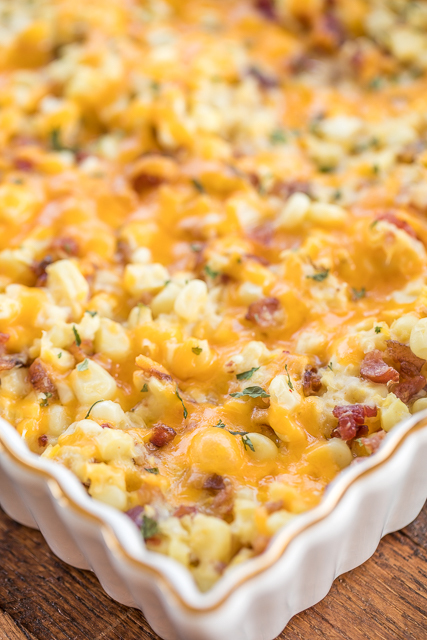 Corn, bacon and cheese - yes, please! This Corn Casserole is really simple to make and is ready to eat in about 30 minutes. You can assemble the casserole ahead of time and refrigerate or freeze for later. This makes a lot of corn, so it would be great for a cookout, potluck or holiday meal. I like to divide the mixture into two pans and cook one and freeze the second pan for later. In a food processor or blender, combine one package of corn, eggs, flour, sugar, butter and cayenne pepper. Pulse 3 or 4 times, until corn is creamed. Pour mixture into a large bowl. Add remaining package of corn, 1 cup cheddar cheese and bacon. Stir to combine. Pour corn mixture into prepared pan. Top with remaining cheese. This looks REALLY good - thanks! This looks great. I think I will add this to my 4th of July menu! Thanks for sharing so many wonderful dishes! Wonder how it would work with fresh corn? It should be great with fresh corn. Enjoy! About how many cups of fresh corn equals the two packages? Four? I'm all out of flour at the moment. Could I substitute bread crumbs? Can this dish be frozen and heated later? Can this dish be be frozen and heated up later? I think that would be fine - enjoy! I made this for a potluck and it was a huge hit! I added green chile for a little more flavor. Could this be made a day ahead and put in the fridge to bake the following day? Could this be made the day before and put in the fridge to cook the following day? I'm sorry, I have a few questions. If I needed to make this casserole for a dinner of 20 people, how can I determine the amount of ingredients that I need? Also, I see the recipe calls for flour can corn muffin be used as a substitute? and lastly, if I were to make it a day ahead, do I fully bake it and then stick it in the freezer/refrigerator or do I just prep it? I would suggest doubling the recipe for 20 people. You can prepare this the day before and bake it when you are ready. Just keep it in the refrigerator and it should be just fine. I’ve only made this with flour. The flour is used to bind everything together. You can try it with cornmeal, but I don’t know how it will turn out since I haven’t tested it. My guess is that it would probably be fine, but I just can’t say with certainty since I haven’t made it that way. Do you have to add butter to the topping to brown? Does anyone know what the settings would be if I cooked this in the crockpot? I'm making this tonight for the family Christmas gathering. Since there will be sooo many other dishes, I was gong to save half and bake for lunch tomorrow. Because I am only baking half of the recipe today, will I need to reduce the cooking time? Probably not. It will still take about 30 minutes to heat through - especially if you are baking after refrigerating it. Enjoy!! I'm making this for our extended family Christmas gathering tonight. Since there are going to be so many other dishes, I plan to make half tonight the other half tomorrow. Since I am separating into two pans, do I need to reduce the cooking time any? This looks deeeeelish so I am excited to see how it turns out. I'm making this for Christmas dinner. Was wondering how long to cook it in the crockpot? I would guess a couple of hours. I haven't tried it in the slow cooker. This is a great recipe! I've made it before but this time I went for the crockpot for Christmas dinner and it turned out just as good. Though I did decide to put all the cheese in the casserole instead of trying to put any on top. I doubled this and cooked it in the crockpot. It took about 6 hours on high. I would think 3-4 hours for a single batch. Do you mix the ritz crackers in the mix? The recipe does not list the crackers but I saw it mentioned in comments. I love corn and am always looking for new ways to eat it. This recipe sounds amazing. How do I put the whole bag of frozen corn in the processor and still have corn to add later on. Clarify the recipe please.